- Our puppy Sarge has been cooped up inside most of the past two weeks because of the bitterly cold temperatures. 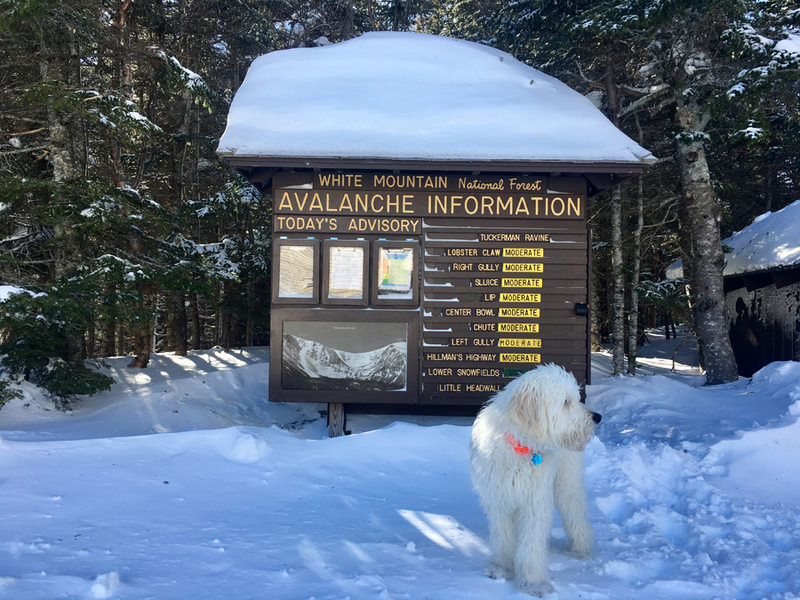 Luckily on Wednesday the temperatures shot up to a balmy twenty degrees, so I put the musher's secret wax on and in between his pads and headed to Pinkham Notch. 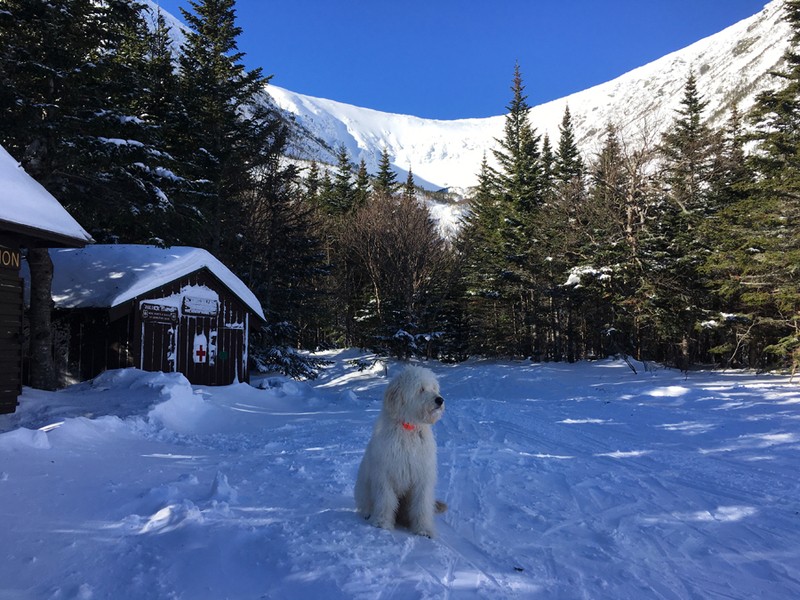 - I took Sarge here knowing that the Tuckerman Ravine Trail would be packed out solid and is a easy ramp like hike to Hermit Lake, AKA "Ho Jo's". This would be his longest adventure yet, but with all his saved up energy it was the perfect spot to get him out. 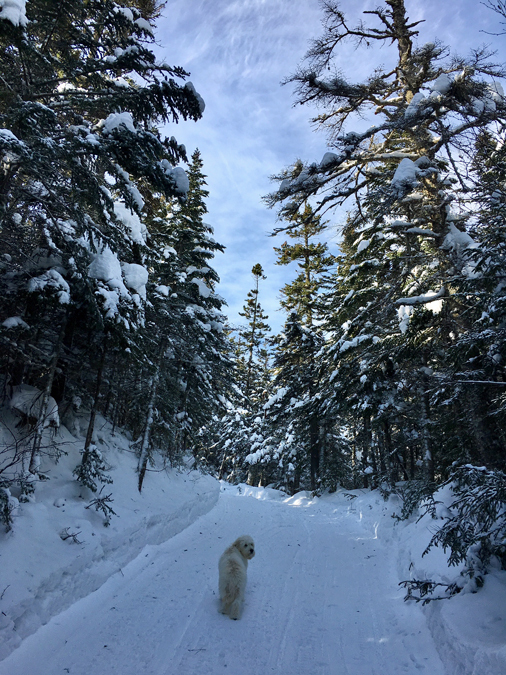 - He absolutely loved it, running up ahead of me and stopping to wait, saying hi to the skiers hiking up to get in some runs. 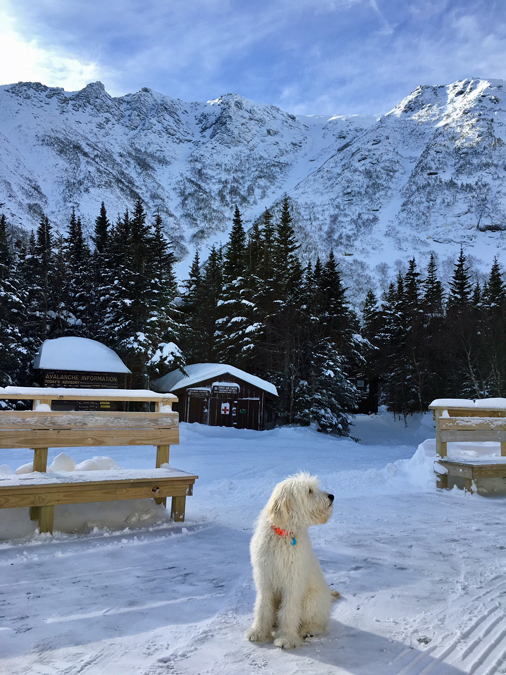 Basically, he wagged his way up to the ranger cabin at Hermit Lake. - After a ten minute break at Hermit Lake, we jogged most of the way back to the lot, stopping a few times to help Sarge get rid of some snow balls that were starting to build up. The Musher's secret makes it easier to remove the built up snow, it slides right off, and he was back to running and grabbing sticks in no time! - It was a blast to get him out of the house and tire him out, unfortunately the worst of the weather was yet to come as this weekend has been arctic brutal! Thankfully the end is in sight as temperatures will be on the rise all week. Hopefully, there will be no more extended periods like this for the rest of the winter but I'm not counting on it, I have a feeling that it might be a rough one, hope I'm off on that. Stay warm and safe everyone! Sarge dreaming about skiing the headwall, or maybe he's just dreaming of cookies! Thanks, Wendy. Sarge is such a fun puppy and he loves the snow!